Today's public safety practitioner faces greater and more complex challenges than at any other time in history. These complex challenges require innovative, creative, and effective solutions. The foundation for these solutions is professional training, offered at three grant-funded institutes at CPSI. We build training solutions in any format, for any delivery method. With years of experience, we have proven methods to complete your project with the quality you desire and within the timeframe you need. We strive to be the vendor of choice in Public Safety Training—both online and onsite. Our training is designed using best practices in Public Safety and state-of-the-art technology. CPSI uses the latest in instructional technology to increase its impact and cost-effectiveness. Technology is integrated into each course we develop to enhance the curriculum and engage the learner. Our courses use Web-based, interactive technology that is showcased in the following projects. 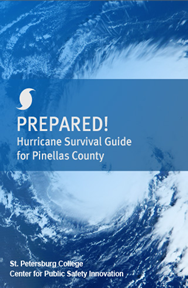 The iPhone Hurricane Web App was developed, in conjunction with Lightmaker USA, Inc., to provide residents of Pinellas County, Florida, with a dynamic iPhone Web application that can be used before, during, and after a hurricane. This app gives residents a one-stop tool on their iPhone device that provides all the necessary information to prepare for, weather, and recover from a hurricane. No more searching for printed storm guides, checking the Internet for information as the storm approaches, or trying to figure out what your needs are for your family, including pets. This app enables residents to have all that information at their fingertips, on a device they have in their possession every day. The Vehicle Inspection Checklist Mini-Game was developed to train Federal, State, and local government personnel, port security operations personnel, and others involved in screening vehicles at security checkpoints. It was developed in partnership with Lightmaker USA, Inc. The M.C.Q.B. 3-D Virtual Ships included in CPSI's maritime domain security courses were developed to train Federal, State, and local government personnel, port security operations personnel, and others involved in screening and boarding vessels. It was developed in partnership with Lightmaker USA, Inc. The Meals on Wheels Association of America (MOWAA) project was developed to introduce emergency support personnel to the Meals on Wheels (MOW) program and to train them on how to develop an emergency plan by coordinating with emergency managers. It was developed as a stand-alone, Flash-based course that included learning interactions, video with closed captions, form-based testing, and a certificate of completion.